10189 Taj Mahal is an Exclusives Sculptures set released in 2008. It contains a large model of the Taj Mahal, and is intended for children ages fourteen and up. Until 2017 and the release of 75192 Millennium Falcon, it was the biggest set LEGO had ever produced, with 5922 pieces. It is based upon the white marble structure that was built at Agra, India during 1632 through 1653. The set is only meant for display and not for everyday play considering its very large size and elegant features. 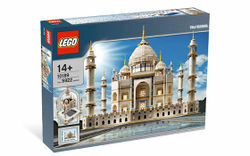 Usually every set contains pieces that average around ten cents per piece, despite this, the Taj Mahal comes with a 5,922, but costs US $299.99 and £199.99, thus equalling $0.05 per piece, an exceptional value by all accounts. The Taj Mahal is composed of three parts that can easily be removed from each other: the dome, a mid-section, and a square plinth. The square plinth is composed of several bright blue baseplates forming a perimeter of 20 x 20 studs with over two hundred white 2 x 2 turntables placed on top. On each corner of the square plinth are tall columns that are topped by a dome. The symmetrical building is formed with arches and bricks with an arch-shaped doorway that is topped by a large dome and finial. This is a description taken from LEGO.com. Please do not modify it. Build the breathtaking Taj Mahal! Measures over 20" (51cm) wide and over 16" (41cm) tall! Facts about "10189 Taj Mahal"
This page was last edited on 27 November 2017, at 17:45.